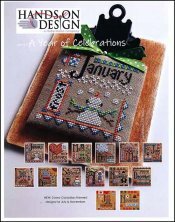 A Year Of Celebrations [H5828] - $18.00 : Yarn Tree, Your wholesale source for cross stitch supplies. Cross stitch pattern by Hands On Design. Look at this adorable design to celebrate each month! January is all about the brrrrrr cold, featuring frosty! February is all about love, featuring hearts! March is about being lucky! Now we can celebrate each month in a fun & decorative way! Stitch counts for each design is 50 x 50. Stitched on #2530 Zweigart Belfast Linen 32ct. Dirty.